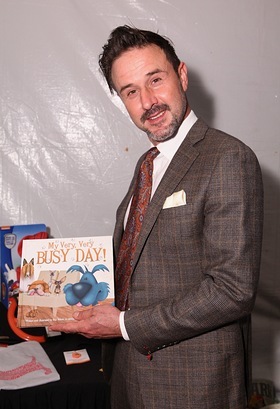 David Arquette With My Very, Very Busy Day! “FOX’s Cause for Paws” is the first-ever rescue dog telethon aiming to find homes for the thousands of shelter dogs in need. The two-hour special, hosted by Hilary Swank, will air Thanksgiving night, Thursday, Nov. 27. Kristin Chenoweth With My Very, Very Busy Day! The book, “My Very, Very Busy Day!” was written to entertain and educate children on what it means to be a responsible pet owner and the importance of preventive veterinary care. Actress Quvenzhané Wallis contributed to the book’s foreword, sharing her love of animals and aspiration of becoming a veterinarian. The book is available at all Banfield Pet Hospital locations nationwide for a suggested donation of $10 to Banfield Charitable Trust, to provide preventive care to pets in need.